Today we’re putting fitness to the side for a second and talking about MONEY. As you might have seen on Instagram, Caleb and I are getting married in June and have been really focused on saving for all the things that comes with that (the wedding itself, honeymoon, and a HOUSE!). I wanted to share a quick tool that’s really helped me to save for all these big events in case it might be helpful to you. I use the Goals feature in my Bank of America savings account to grow and monitor my savings. The Goals feature allows you to set specific savings goals including the amount of the goal and by when you want to meet it. It is incredibly easy to set up and monitor as you continue to contribute more to savings. A snapshot of what your Goals look like in the app. Nothing better than seeing a goal completed! Every time I roll over money from my BoA checking account, I can decide where that money will go and physically move it to each goal. I made a rule for myself that for each roll over to savings, at least half would go to my down payment and then the rest would be split between my wedding and honeymoon goals. The manual act of assigning my money towards specific goals has been incredibly helpful and has made the act of saving so much more tangible and frankly, exciting. When you’re ready to cash in a goal, you can easily rearrange the priority of your goals to tell the app from which bucket to take the money first so you can keep your other goals moving without worrying about messing up the numbers. Capital One - They have a similar “My Savings Goals” feature. I really like that they keep track of all the goals that you’ve achieved. PNC - While I don’t see that they have a goals feature, they do have some neat automated features to set up automatic transfers to your savings account to keep that growing. Mint - I really like Mint for their ability to aggregate all of your accounts and give you a holistic picture of your spending. 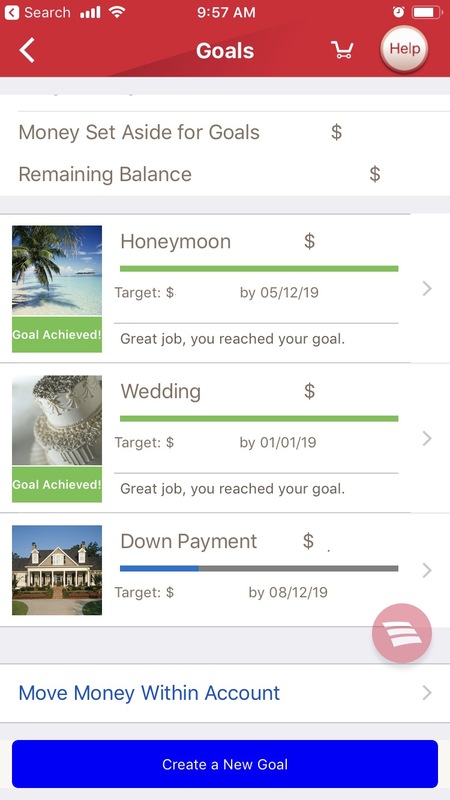 While they do have a Goals feature, it’s not my favorite as you can’t allocate portions of money within existing accounts and you can’t access your goals from their app (lame). Wells Fargo and Fifth Third- Both have options for saving towards a goal though it doesn’t look like you can have multiple goals within an account. One other savings tip to share if you’re ready to take it to the next level is to look into high yield savings account. When my down savings goal got pretty hefty, I transferred that and my emergency savings to a higher yield savings account through Discover. (I get a 2.1% return versus 0.03% at BoA) That way it’s easy to access the money should I need it and I get a much more favorable return on that larger chunk of money. Since then, I’ve set up a quarterly reminder for myself to transfer over my growing BoA down payment savings to Discover to keep feeding that account. I hope this is helpful to you for whatever goal you’re saving towards. Please let me know what other money questions you have!